Handing out new socks at St. John’s Hospice in Philadlephia. Rachel Matsuo (L) and Tracy McGuckin, volunteers for the nonprofit The Joy of Sox, handing out new socks to those experiencing homelessness at St. John’s Hospice in Philadelphia. Helping others help others. That’s what The Joy of Sox® is great at doing. St John’s Hospice, established in 1963, is a facility in Philadelphia that provides meals, support and housing for men experiencing homelessness. 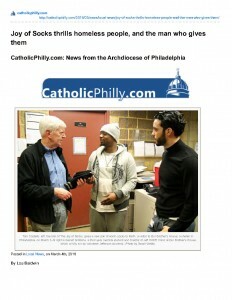 St. John’s was created as an outreach ministry to serve and assist the poor and homeless in the community. They continue to provide crucial, life-sustaining services with dignity, respect and compassion to homeless men in Philadelphia. One item that they need, and The Joy of Sox has is new socks. 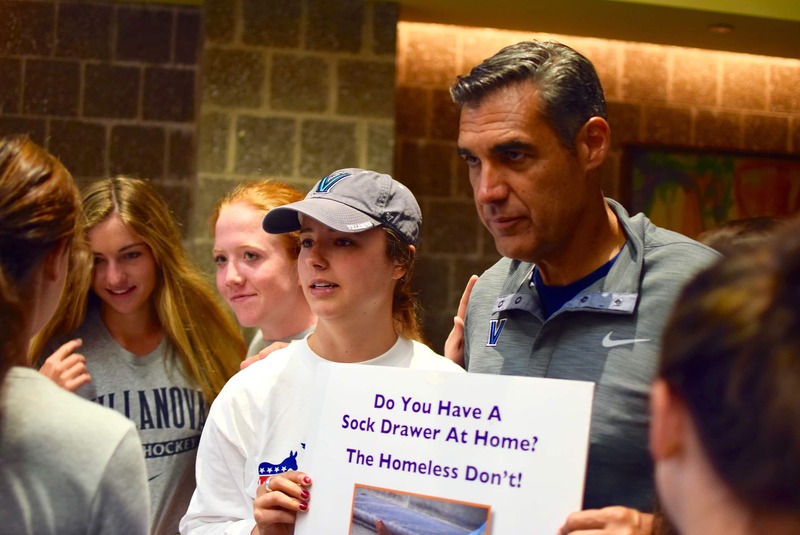 The photo shows Rachel Matsuo (L), a junior at Villanova University, and Tracy McGuckin handing out new sock as some men come into St. John’s for lunch. As volunteers they handed out around 275 pairs of new socks to very grateful individuals. Helping others help others is what The Joy of Sox does. In this case they were helping St. John’s help those who came in for a hot meal. About The Joy of Sox. 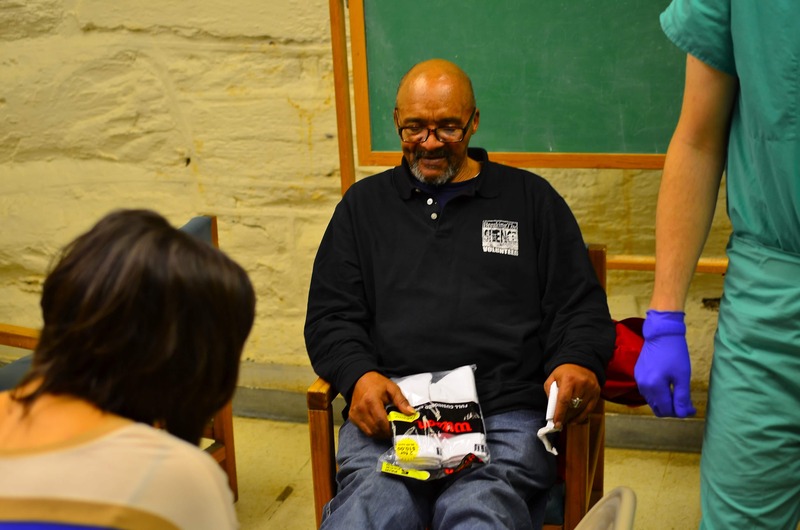 The Joy of Sox® is a Philadelphia-based 501(c)(3) nonprofit with the mission of giving joy to those experiencing homelessness by giving them new socks. 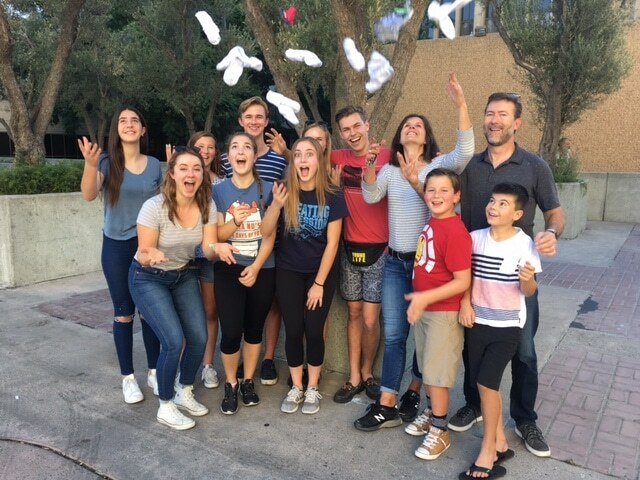 Their vision is to be the best sock charity in the United States, and to every person experiencing homelessness in America six pairs of new socks every year. Founded in 2010 they have given over 277,600 pairs of new socks – over a quarter of a million pairs! – to those experiencing homelessness in 33 states and five countries. For more information please visit www.TJoS.org. The Joy of Sox, a nonprofit providing new socks to those experiencing homelessness, earned Guidestar’s 2018 Platinum Seal of Approval. The Joy of Sox, a 501(c)(3) nonprofit, that provides new socks to those experiencing homelessness earned the 2018 Platinum GuideStar Nonprofit Profile Seal of Transparency, the highest level of recognition offered by GuideStar, the world’s largest source of nonprofit information. 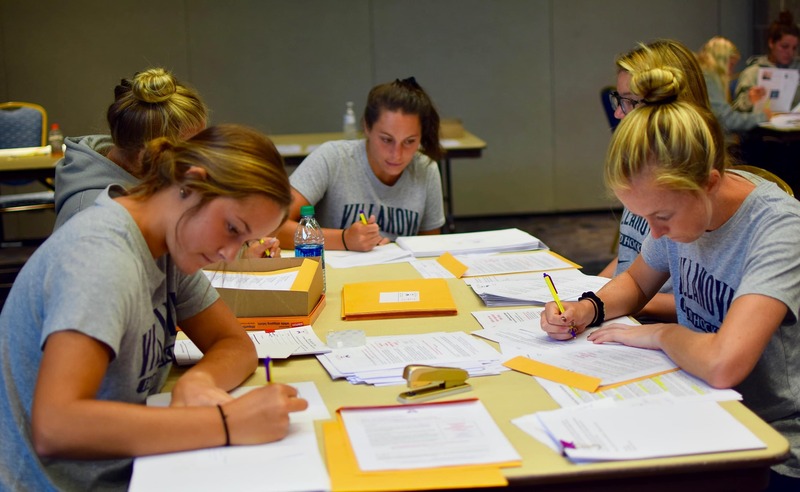 By sharing metrics that highlight progress The Joy of Sox is making toward its mission, the organization is helping donors move beyond simplistic ways of nonprofit evaluation such as overhead ratios. To reach the Platinum level, The Joy of Sox added extensive information to its Nonprofit Profile on GuideStar: basic contact and organizational information; in-depth financial information; qualitative information about goals, strategies, and capabilities; and quantitative information about results and progress toward its mission. 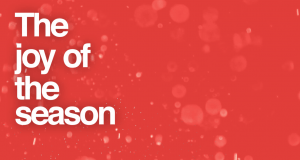 By taking the time to provide this information, The Joy of Sox has demonstrated its commitment to transparency and to giving donors and funders meaningful data to evaluate The Joy of Sox. About The Joy of Sox. 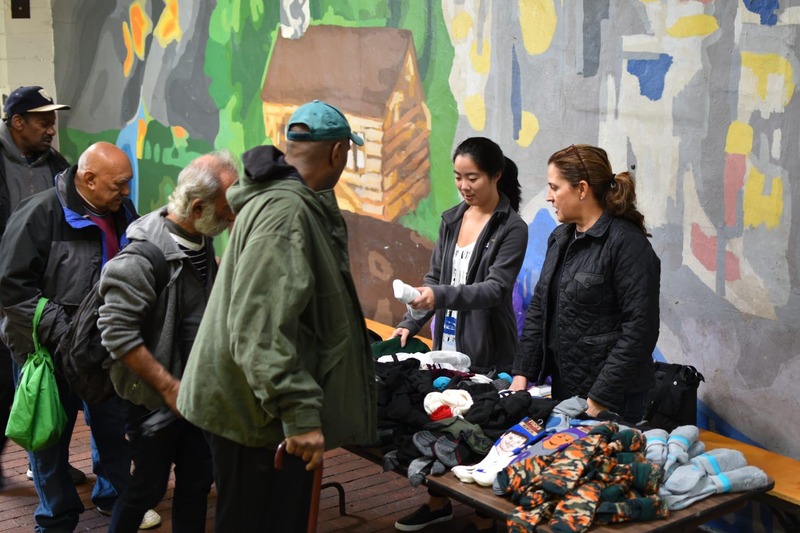 The Joy of Sox® is a Philadelphia-based 501(c)(3) nonprofit with the mission of giving joy to those experiencing homelessness by giving them new socks. Their vision is to be the best sock charity in the United States, and to every person experiencing homelessness in America six pairs of new socks every year. Founded in 2010 they have given over 277,600 pairs of new socks – over a quarter of a million pairs! – to the homeless in 33 states and five countries. For more information please visit www.TJoS.org. Handing out news socks to the homeless at Grace Cafe, Arch Street Methodist Church, Philadelphia, PA. Eliza Clark, an intern from Villanova University for The Joy of Sox, a nonprofit that gives joy to the homeless by giving them new socks, talks with two homeless men. 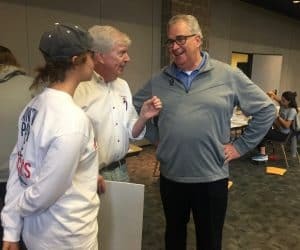 An observation by Tom Costello, Jr.
Earl did not talk about politics, or tragedies. 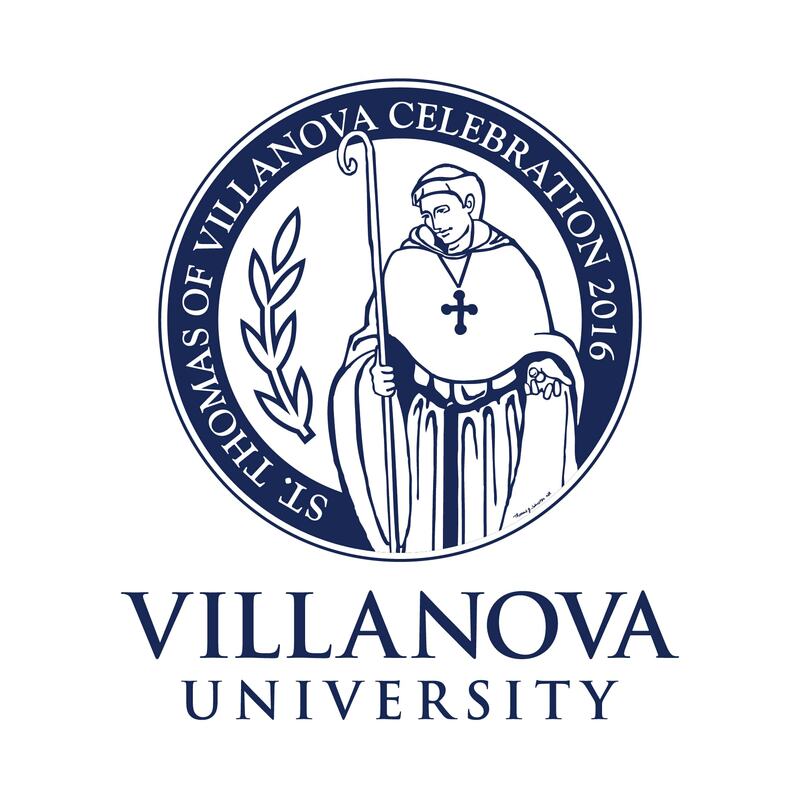 He wanted to talk about Villanova basketball. He wanted to talk about turning his life around, not getting high. And he wanted to talk about socks. I listened. On a cold March Sunday evening in the basement of Arch Street Methodist Church, near City Hall in Philadelphia I listened to Earl. Earl is a homeless man, maybe 40 or so, hard to tell. He seemed happy. He had just finished dinner at the Grace Café, a hot meal program run by the church. A Nor’easter had hit Philly two days before. It had been cold, snowy and very windy. And yet, smiling Earl was living on the streets without socks. I can’t imagine how painful that must be to walk around with cold wet feet. But I don’t think that’s an unusual experience for the homeless. Most non-homeless people donate their old clothes to charity, but throw away their old socks because they are worn or have holes in them. So, at clothing distribution places the “Earls” of this world may get shirts, sweaters or even North Face jackets, but rarely new socks. Earl went on to talk about his friend Tony, said he knew him back in the day. He said he was a great player, but more importantly a great person. Earl then talked more about turning his life around, and as he said that he literally turned around in a circle. We chatted for a few more minutes about Tony. I listened. He turned around a few more times. Still smiling. I could tell he was ready to move on when he leaned into me and quietly asked if he could have another pairs of socks. “These are wonderful,” he said. I smiled and gave him a bunch. He hugged me, said God bless you, and walked up the stairs out into the cold Philly night. On my way home, in my warm car, wearing warm socks, I turned off the radio. No need to hear about the latest disturbing news events from Washington. Instead, I reflected on the Earls of the world and wanted to do more. In reading about Peace and Justice issues I realize the movement aims to resolve injustice and conflict, and advocate for a just and peaceful world. I’m convinced that ending homelessness is a major part of the movement. But I’m also convinced that although we cannot get the Earls and others experiencing homelessness off the streets, at least we can help make their days a little bit more comfortable. At least for a couple of weeks Earl will have warmer toes. And that makes me smile. Peace and justice…with socks. Tom Costello, Jr. is the Chief Sock Person & Founder of The Joy of Sox®. The Joy of Sox® is a Philadelphia-based 501(c )(3) nonprofit with the mission of giving joy to the homeless by giving them new socks. 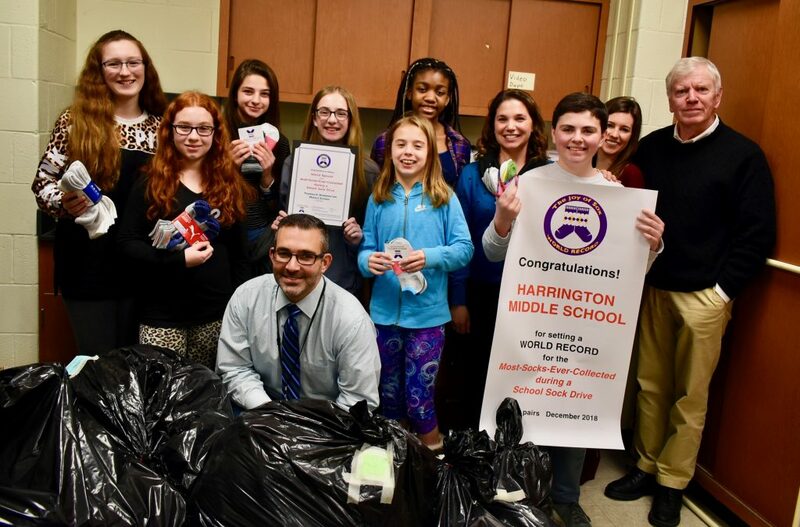 Their vision is to be the best sock charity in the United States and to give six pairs of new socks to every homeless person in the America six times every year. Founded in 2010 they have given over 250, 430 pairs of new socks – over a quarter of a million pairs! – to the homeless in 31 states and five countries. For more information please visit www.TheJoyOfSox.org. A resolution sponsored by Senator Kip Bateman designating February 14 of each year as “Socks for the Homeless Day” has been approved by the Senate Health, Human Services & Senior Citizens Committee. 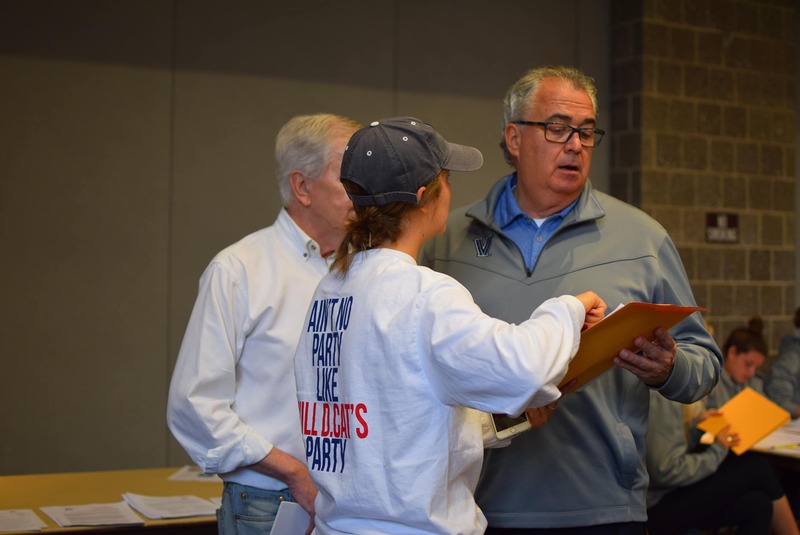 The joint resolution, SJR-17, has been championed by Tom Costello Jr., founder and Chief Sock Person at The Joy of Sox, a 501(c)(3) nonprofit organization that provides socks for the homeless. 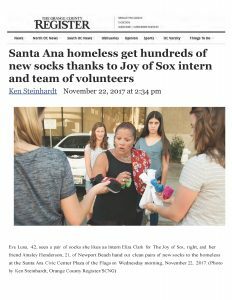 Santa Ana homeless get hundreds of new socks thanks to Joy of Sox intern and team of volunteers. 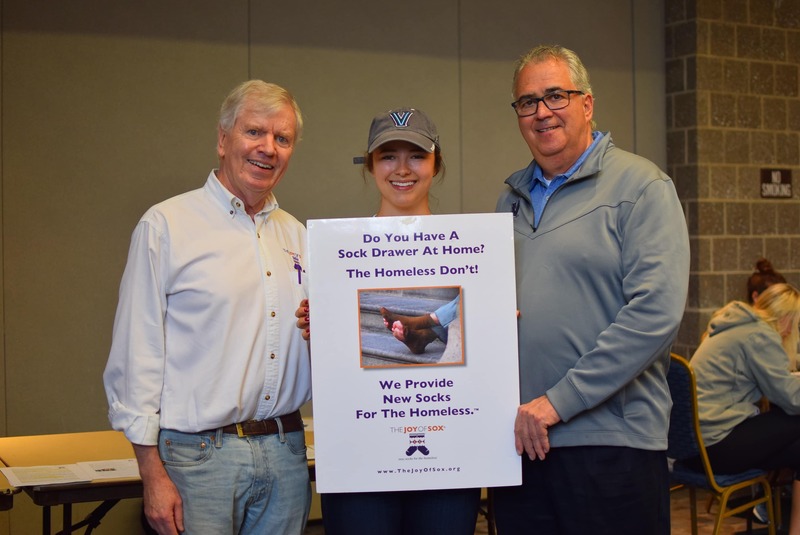 The Ocean County REGISTER covered the story of Eliza Clark, a senior at Villanova University, and the Chief Sock Intern for The Joy of Sox®, organizing 11 volunteers to pass out 597 pairs of new socks to the homeless. Ken Steinhardt, of The Orange County (CA) REGISTER covered the sock pass out that Eliza Clark orchestrated. Eliza Clark of Newport Beach helped improve the comfort of homeless people in Santa Ana, Wednesday morning, Nov. 22, as she and 11 volunteers passed out hundreds of pairs of new socks to those living around the Civic Center Plaza of the Flags. 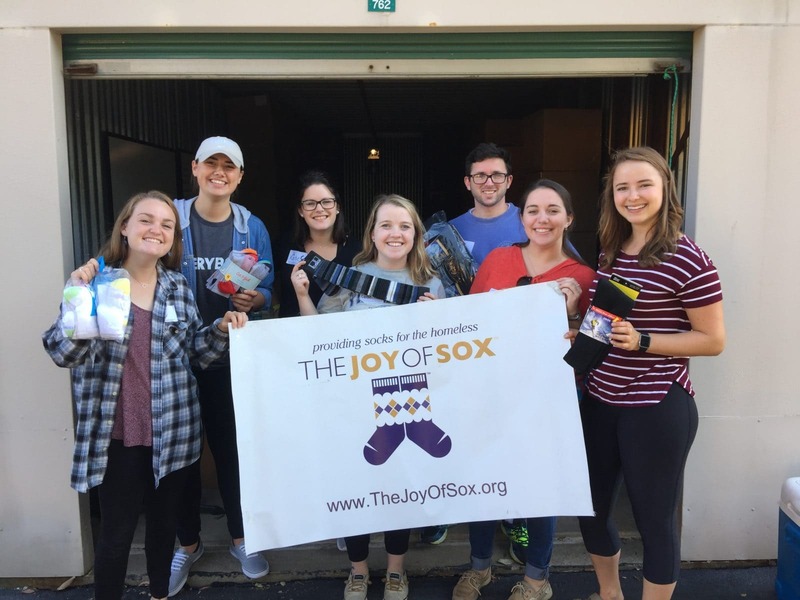 Clark distributed the socks as part of her internship with the nonprofit The Joy of Sox®. She learned about the organization while studying Peace and Justice, with a minor in Communications, at Villanova University, where she’s now a senior. 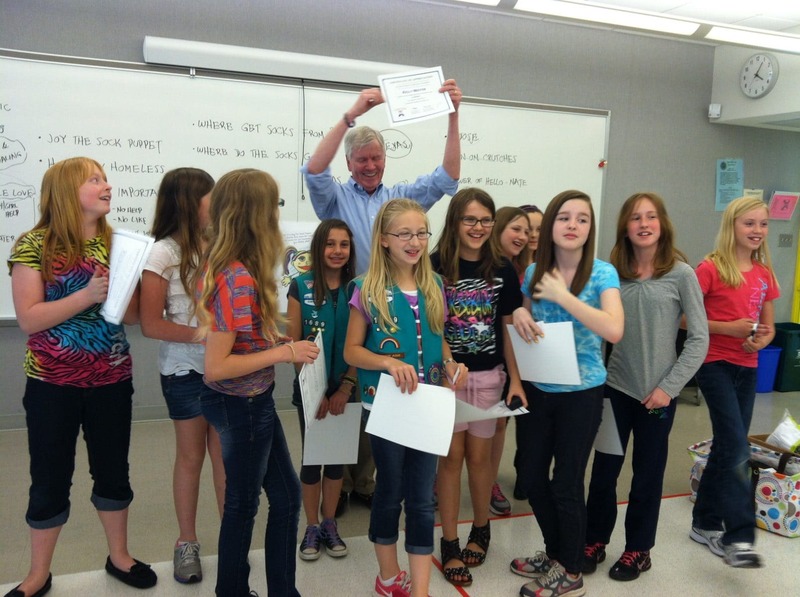 She earned the internship following a thank you letter she wrote after volunteering. Clark and her volunteers distributed the bundle of 597 new socks in about 15 minutes after being surrounded when they arrived at the plaza. The happy Eliza Clark Sock Pass Out Team in Santa Ana, CA. 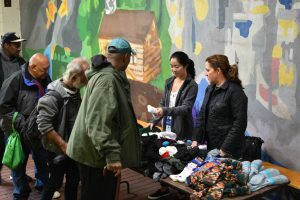 They passed out 597 pairs of new socks to the homeless near the Santa Ana Civic Center. 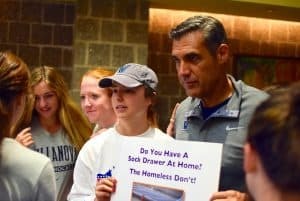 Eliza, a senior at Villanova University, is the Chief Sock Intern for The Joy of Sox, a nonprofit that gives news socks to the homeless. In return, they received many “Happy Thanksgiving” wishes. For a link to the story click here. For a pdf of the story click here. 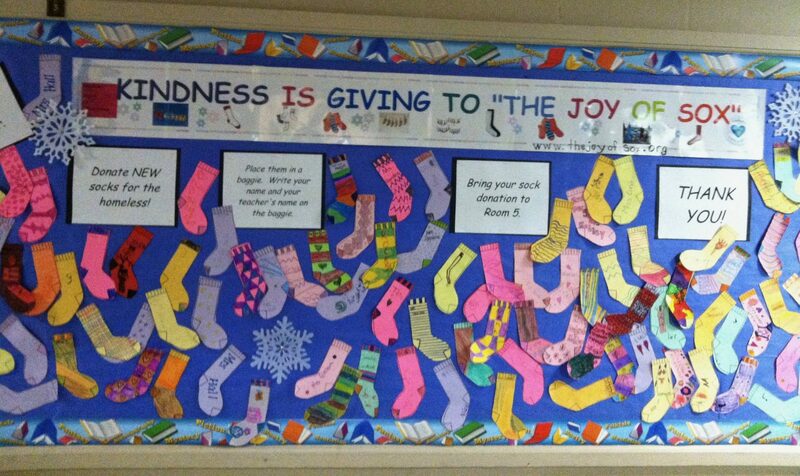 The Joy of Sox is very grateful to Hyland’s in LA for donating the new socks that were given to the homeless. 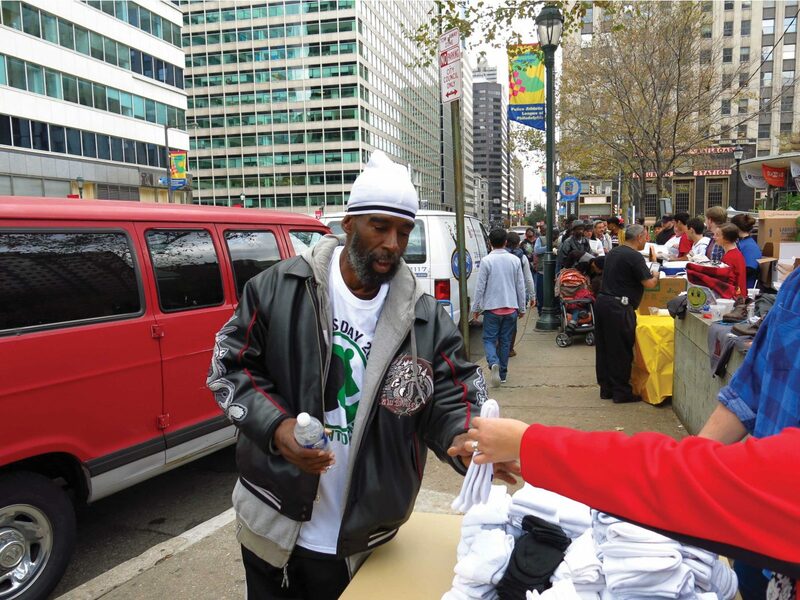 The Joy of Sox® is a Philadelphia-based 501(c )(3) nonprofit with the mission of giving joy to the homeless by giving them new socks. Their vision is to be able to give six pairs of new socks to every homeless person in the United States several times a year. Founded in 2010 they have given over 246,200 pairs of new socks (almost a quarter of a million pairs!) to the homeless in 31 states and four countries. For more information please visit www.TheJoyOfSox.org. 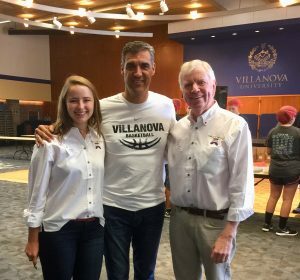 At the St. Thomas of Villanova Day of Service 2017 at Villanova University is Coach Jay Wright (2016 NCAA Basketball Champions! ), Eliza Clark, Chief Sock Intern, and Tom Costello Jr, Chief Sock Person and Founder The Joy of Sox (providing new socks for the homeless). One million is a BIG number…a really BIG number. 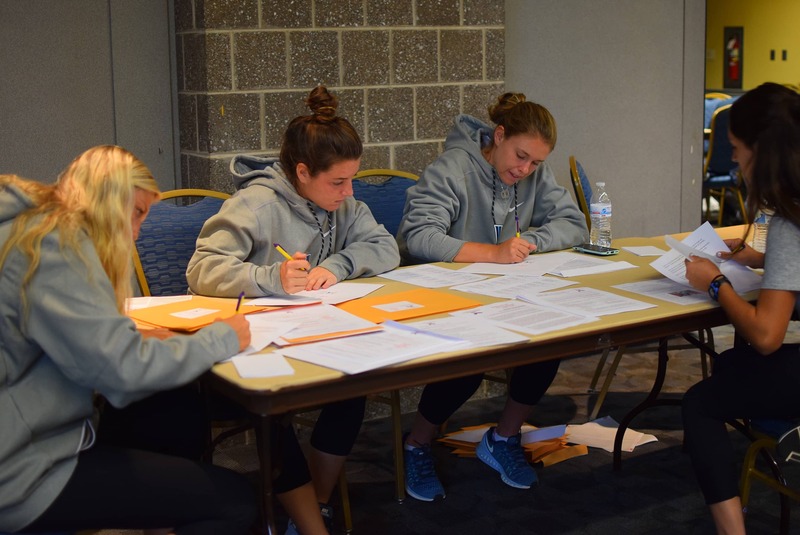 But that’s the number of toes that the nonprofit The Joy of Sox® hopes to make warm, dry and happy as a result of a mailing campaign that was conducted on September 23rd at Villanova University as part of their annual St. Thomas of Villanova Day of Service. For the mail campaign, a “package” was mailed to 204 catholic and private schools in Philadelphia, the surrounding Pennsylvania suburbs, and areas in southern New Jersey and northern Delaware. 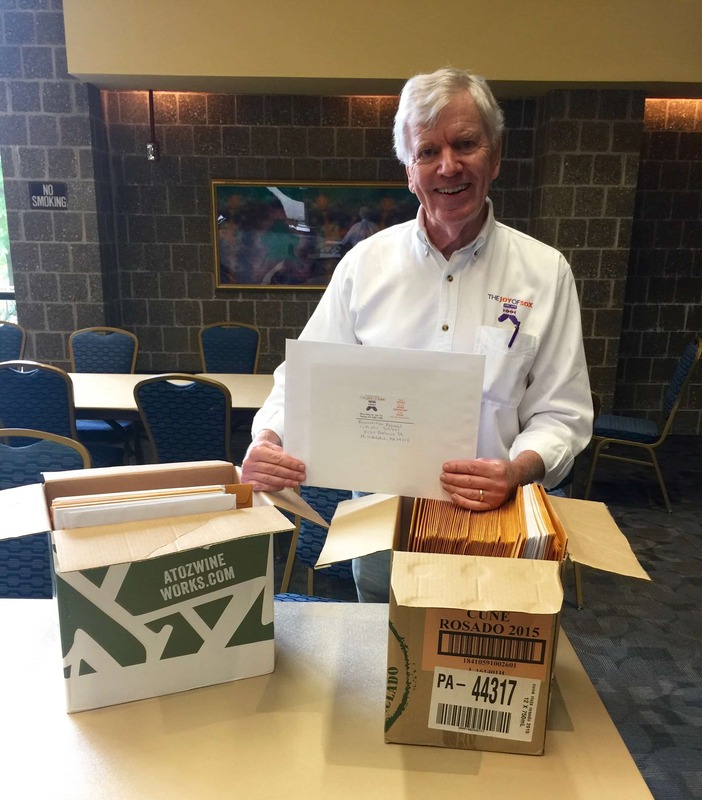 The package contains a letter to the schools suggesting they consider a sock drive as a community service project, plus a few handouts about the nonprofit. 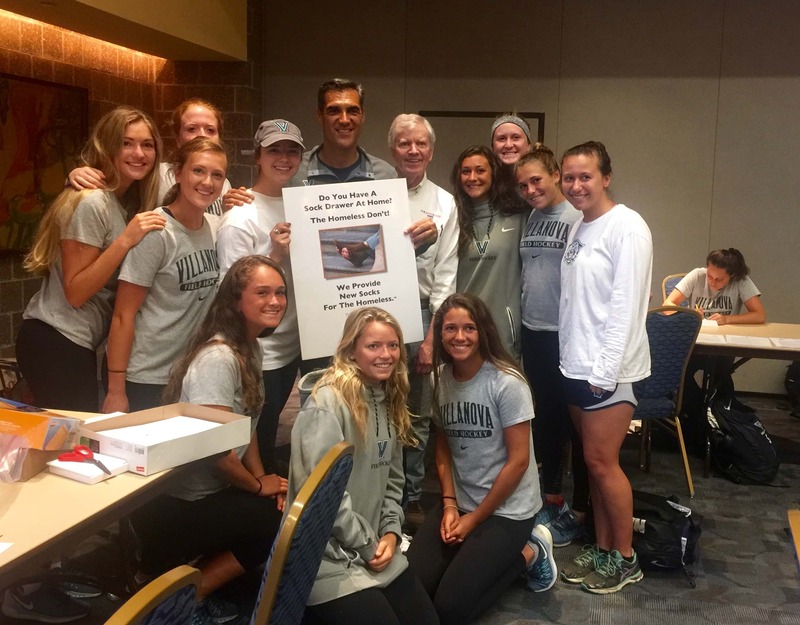 The Villanova University’s Men’s varsity tennis team help put together the mailing packages for the One Million Warm Dry And Happy Toes Campaign for the Homeless for The Joy of Sox®. Pictured with the team, 5th from left, is Villanova Coach Jay Wright of the 2016 NCAA Basketball Champions. On the right is Eliza Clark, Chief Sock Intern, and Tom Costello Jr, Chief Sock Person and Founder. 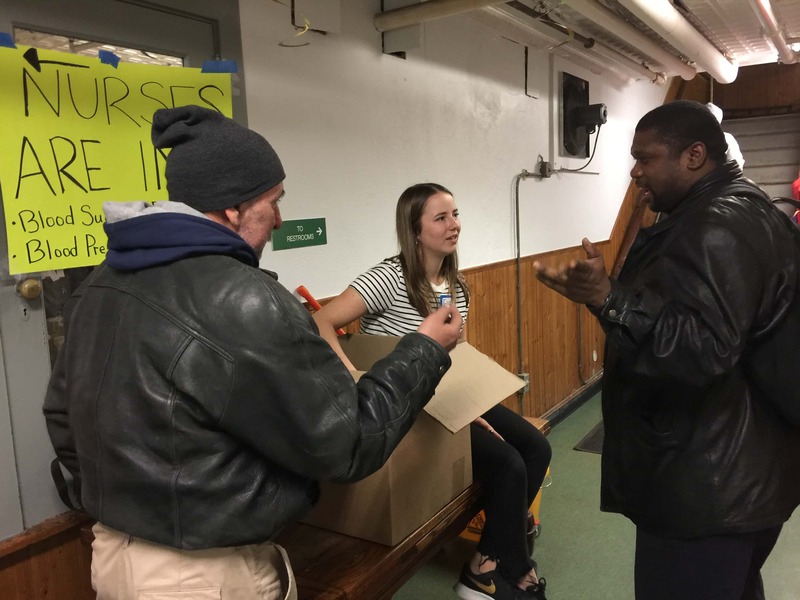 The Joy of Sox is a nonprofit that gives new socks to the homeless. Eliza and Tom wonder if, or when, they collect the 100,000 pairs whether it would be some sort of a record. 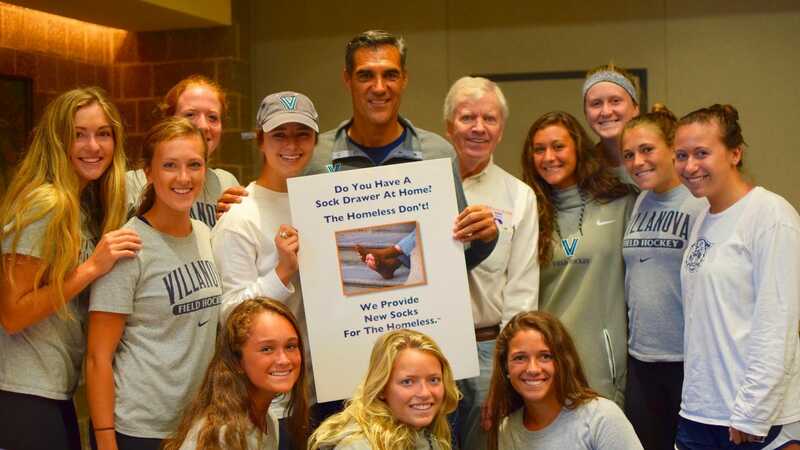 But whether it’s a record or not, The Joy of Sox and their Villanova helpers, would have done a wonderful thing by helping make one million homeless toes warm, dry and happy. The campaign runs for the entire school year and ends at the end of May 2018. And if more schools from around Philadelphia or around the nation get on board maybe the number will be a lot more than one million! 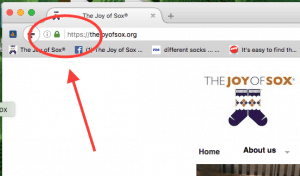 The Joy of Sox, a nonprofit providing new socks for the homeless, adopted the new socks emoji, and is an official bronze sponsor. There are emoji for lots of thing like ⚾️ baseballs and  balloons. And coming soon is an … emoji for SOCKS. 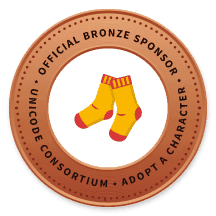 So The Joy of Sox, as an Official Bronze Sponsor, adopted the Socks Emoji. The socks emoji is not officially released yet, but will be available on your favorite device this spring. The Joy of Sox® is a Philadelphia-based 501(c )(3) nonprofit with the mission of giving joy to the homeless by giving them new socks. Their vision is to be able to give several pairs of new socks to every homeless person in the United States several times a year. Founded in 2010 they have given over 215,000 pairs of new socks to the homeless in 30 states and four countries. For more information please visit www.TheJoyOfSox.org. What do London, UK, San Diego, CA, Charleston, SC, New York, NY, Bear, DE and Gambell, Alaska all have in common? 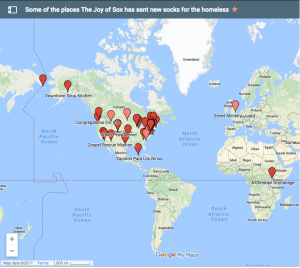 A Google map showing places that The Joy of Sox® has sent new socks for the homeless. The Joy of Sox is a nonprofit with a mission of giving joy to the homeless by giving them new socks. They are all places that The Joy of Sox® have recently sent new socks for the homeless and needy! Clicking on the map will take you to their “map page” where you can see where the socks have gone. People Magazine’s PeopleNow ran a human interest story for their hometown hero segment about Tom Costello Jr and The Joy of Sox. The story consisted of an article by Cathy Free and a short TV interview via Skype by PeopleNow host Andrea Boehlke. Why were you afraid of the homeless? What are some common misconceptions about the homeless? How can people find out more and help? A link to the PeopleNow TV segment is here. The article talks about Tom overcoming his initial fear of the homeless and going on to start a nonprofit to provide a much needed, but rarely donated item of clothing – socks. The Joy of Sox® is a Philadelphia-based 501(c )(3) nonprofit with the mission to give joy to the homeless by giving them new socks. 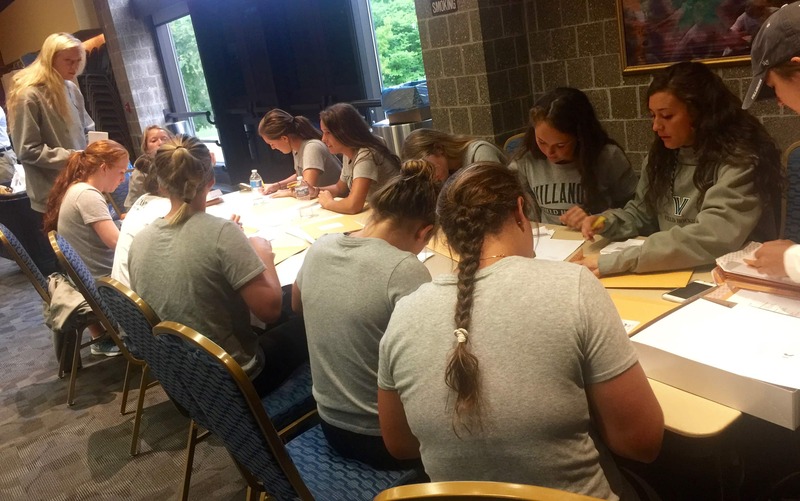 Their vision is to be able to give several pairs of new socks to every homeless person in the United States several times a year. Founded in 2010 they have given over 204,000 pairs of new socks to the homeless in 29 states and three countries. A link to a pdf file of the article is here. A link to The Joy of Sox website is here. What Are the Top-Rated Awards? 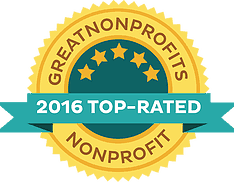 The GreatNonprofits Top-Rated Awards is the one and only people’s choice award where volunteers, donors, and people served by nonprofits are asked to share stories of inspiration, express their appreciation, and potentially help nonprofits earn a spot on the prestigious GreatNonprofits Top-Rated Nonprofits List. The Joy of Sox, a nonprofit providing new socks for the homeless, received the 2016 TOP-RATED NONPROFIT award from GreatNonprofits. The Joy of Sox is a Philadelphia-based 501(c )(3) nonprofit with the mission to give joy to the homeless by giving them new socks. 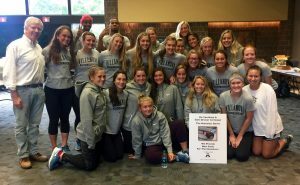 Their vision is to be able to give several pairs of new socks to every homeless person in the United States several times a year. 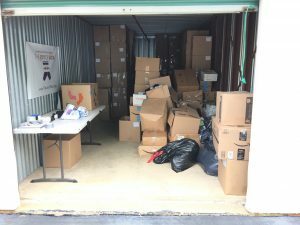 Founded in 2010 they have given over 193,000 pairs of new socks to the homeless in 28 states and three countries. Clink here to see their page at GreatNonprofits. Click here to contact them. The Joy of Sox, a nonprofit that provides joy to the homeless by giving them new socks, received Guide Star’s Gold Participant level award. 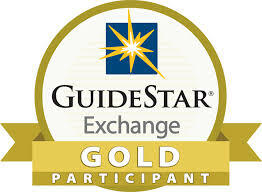 Today The Joy of Sox received the GuideStar Exchange’s Gold Participant level, a leading symbol of transparency and accountability provided by GuideStar USA, Inc, the premier source of nonprofit information. 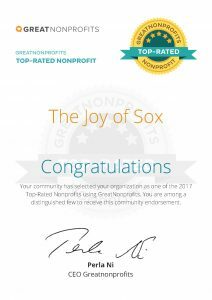 This level demonstrates The Joy of Sox’s deep commitment to nonprofit transparency and accountability. In order to be awarded the GuideStar Exchange logo, we had to fill out every required field of our nonprofit report page on www.guidestar.org for the Gold level of participation.